Airs Wednesday, September 28 at 8 p.m. Music and Liturgy for Rosh Hashanah, (The Jewish New Year) Sung by The Western Wind with Guest Cantors, Narrated by Leonard Nimoy. In this classic performance, Leonard Nimoy and The Western Wind Vocal Ensemble join forces to explore the rich and profound musical and spiritual traditions of the Jewish High Holy Days. The Birthday of the World presents some of the most inspiring music in the Jewish liturgical tradition, performed by the acclaimed vocal ensemble The Western Wind. Mr. Nimoy's timeless narration focuses on the universal themes of redemption and divine forgiveness. 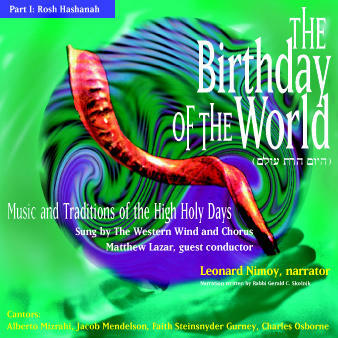 "Sung by The Western Wind Vocal Ensemble with outstanding cantors, this is an ideal High Holy Days service with a splendid narration by Leonard Nimoy, the performance is outstanding for the beauty of its artistry.